other colored gemstones with confidence and knowledge. With more varieties than ever before to choose from, including altogether new gems, revolutionary new cuts and new ways to buy gems—such as Internet auctions and TV shopping—there has never been a more exciting time to buy or collect colored gemstones. But there are also new high-tech treatments and sophisticated frauds to look out for. Lack of information, error or misrepresentation can make the thrill of buying a gem or piece of jewelry confusing, intimidating, overwhelming and costly. Buyers need a source of expert guidance.  What qualifies as a “gemstone”?  How to evaluate color—and its impact on price.  Deciding between a natural gem and an enhanced gem … and new glass-gemstone compositions.  Colored gemstone synthesis and treatment.  What to ask when buying the stone.  What to get in writing.  How to get what you want within your budget.  Price guides for popular gems, opals and synthetic stones.  Important information about buying on the Internet. 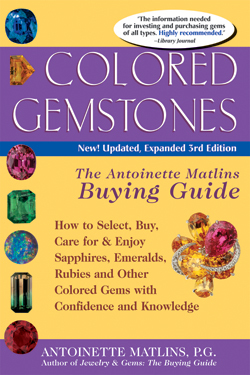 Written by an “insider,” this easy-to-read guide is the “unofficial colored gemstone bible” for anyone who wants to get the most for their money and enjoy what they have purchased. Antoinette Matlins, P.G., is an internationally respected gem and jewelry expert, author, and lecturer. Honored with the international Accredited Gemologists Association’s highest award for excellence in gemology, Ms. Matlins is the author of many books that are widely used throughout the world by consumers and professionals in the gem and jewelry field. Her books include Jewelry & Gems: The Buying Guide (over 400,000 copies now in print—the only book of its kind ever offered by Consumer Reports); Gem Identification Made Easy: A Hands-On Guide to More Confident Buying & Selling; The Pearl Book: The Definitive Buying Guide; Diamonds: The Antoinette Matlins Buying Guide; Engagement & Wedding Rings: The Definitive Buying Guide for People in Love; and Jewelry & Gems at Auction: The Definitive Guide to Buying & Selling at the Auction House & on Internet Auction Sites (all GemStone Press). Ms. Matlins has gained wide recognition as a dedicated consumer advocate. She has spearheaded the Accredited Gemologists Association’s nationwide campaign against gemstone investment telemarketing scams. A popular media guest, she has been seen on ABC, CBS, NBC, and CNN, educating consumers about gems and jewelry and exposing fraud. In addition to her educational work, Ms. Matlins is retained by clients worldwide to seek fine, rare, or unusual gems and jewels for acquisition.